Happy Bloggers Challenge Friday! Thanks to those who played along with last weeks Sketch Challenge, it's always wonderful to see so many different takes one one sketch. Sketches are usually my starting point when creating, although most of the time I end up off track with something totally different! This weeks Bloggers Challenge is Ribbon and Lace. Those of you who know me, must really think I've lost it. If you look back on my blog over the past years, you'd hardly ever find a trace of ribbon, yet alone lace on my projects. This past year with some enabling from some friends, I've found that Ribbon and Lace can be my friend! Heck, I think I even surprised a few of you when I started adding Flourish Gems to my cards! As with most of my projects, I sat down to create and ended up far from where my original creative process was. Let's just say I couldn't find my lace that I wanted to use to create a background with. I think I tossed it as it was looked rather muddy! Anyhow, a challenge is a challenge, so I decided to created some Rolled Roses out of Crinkle Ribbon, Lace (Crochet Trim), and Twill Ribbon. LOVE these Ribbon Roses as they are so easy to create! Again, I'm using of my scraps of My Minds Eye Papers, and paired them up with this beautiful image and sentiment from Our Daily Bread Designs. I dyed the Crochet Lace with Rangers Broken China Distress Stain. Both this flower and the Crinkle Flower were created in the same manner - punch a 3/4" Circle and use about 12" of ribbon - you'll want to add adhesive to the circle before you begin. Tie a knot in one end and adhere that to the center of your circle, then take the rest of the ribbon, twist and turn as you wrap it around the center knot, until the circle is complete, flip the end to the back and secure. The larger (Orange) flower started out with a 1" circle. If you'd like to play along with this weeks Bloggers Challenge, please link back to this post on your blog and mention you created your card for the Bloggers Challenge Ribbon and Lace Challenge. Please add your link using the Link Tool below. Just a note on the link tool, your link should be a direct link to your Bloggers Challenge Post, use your name as the Title. Please do not link to cards that were created prior to the challenge date. Entries not linking properly will be removed. Gorgeous, Beautiful and Elegant! I had a good chuckle when I saw your blog post title! Thanks for the details on how to create the flowers! Wow, this is just jaw dropping gorgeous! Love your flowers and all the added embellishments. This card should just be framed and hung on the wall--beautiful! 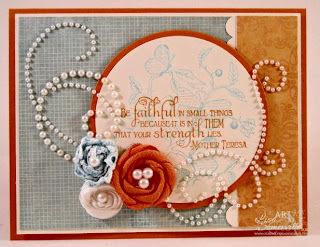 Oo AMAZING card Lisa..I saw your sneak peak & just had to quickly scroll down to see your card in full! Love your hand-made flowers. They are delightful. How clever! Lovely, lovely, lovely! Love your flowers and the color combo, great challenge! Such a beautiful card. The flowers are gorgeous, the paper is wonderful, and the pearls take it to a whole other level. Fabulous card. Beautiful card and flowers, Lisa! So you want me to be pretty with ribbon and lace, now that is a challenge? Have a great weekend! Lisa--Your card is striking--deleicate & charming. You did a great job on it! Wow! Well you have certainly embraced ribbon/lace in a gorgeous fashion. Love your bling and the ribbon flowers. Whether you expected the card to come out like this or not...it is BEAUTIFUL! I love everything about it. And, thank you for including the directions on those lovely flowers again! I wish I could stop and try something every time I first see it! I know you understand that! Lovely, lovely card, even though I can't make out the Sentiment...I am sure it is wonderful as the rest of the card. Your ribbon roses look amazing, love them!! Love the colors on this creation, they are some of my favorite combinations. Very nice card Lisa. So elegant. Very Very Victorian with pearls and lace. Love the roses, and the card so is elegant. Love your ribbon garden! So very well done! Hope you and the family have a blessed Easter! Beautiful card! Love the ribbon flowers (will have to try these) and all the pearls! Happy Easter, GF! This is a truly lovely card, Lisa! Love those ribbon roses...I'm going to try that technique. Thanks for the instructions. Lots of beautiful embellishments on this card. Your card is beautiful, it's always amazing when we create something we don't think we have in us.